Professor George Sosnovsky was born in 12.12.1920 in St. Petersburg, Russia. He was a Professor of Chemistry and Biochemistry at the University of Wisconsin Milwaukee from 1967 to 2018. 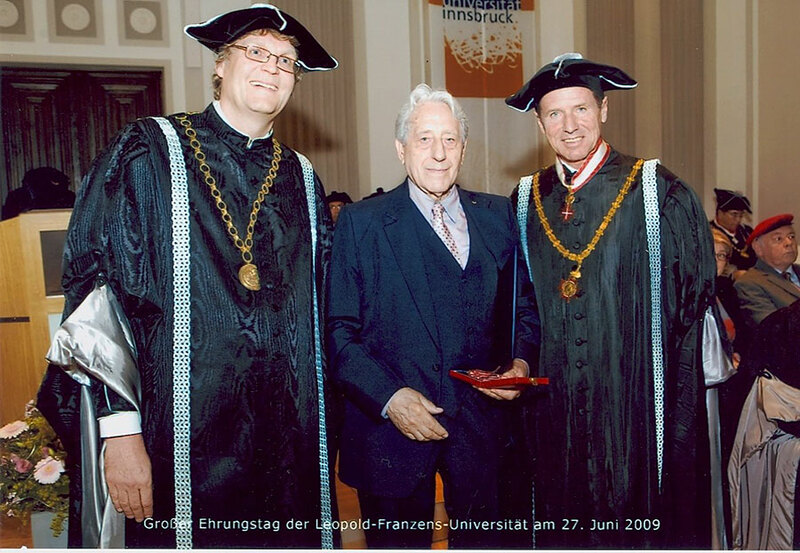 George received his PhD from the University of Innsbruck in 1948, where he met his wife Christine who was born in Vienna. Christine received her PhD in 1949 from the Department of Physical Chemistry (University of Innsbruck) and both went to Melbourne (Australia) for a brighter future. Christine and George worked for the Commonwealth Scientific and Industrial Research Organization at the University of Melbourne. A couple of years later, George worked for Imperial Chemical Industries Australia, north of Adelaide. In 1956, George was invited to work for Professor M.S. Kharasch at the University of Chicago as a postdoctoral Research Associate. Dr. Christine Sosnovsky joined him a year later in the United States and started at the Illinois Institute of Technology Research Institute (IITRI) in Chicago. Unexpectedly, Prof. Kharasch died in 1957 prompting Dr. Sosnovsky to work as a Senior Scientist at IITRI. In 1963, he got promoted to Associate Professor and was invited as Senior Research Fellow of Public Health Service at the University College in London and the University of Tübingen (1967-1968). Two years later Christine was promoted to Associate Professor as well and taught on the topics of physics and chemistry of solid surfaces. In 1967, George accepted a position as Professor at UWM and was responsible for the design of the current Chemistry Building. He co-founded the Journal Synthesis in 1969 and served as editor from 1969-1985. Dr. Sosnovsky has authored more than 175 publications and wrote two books. His first book titled “free Radical Reaction in Preparative Organic Chemistry” was published by MacMillan in 1964. He wrote his second book in his 90s titled “Solar-Energy-Absorbing Substances and Oxidative Stress and Inflammatory Diseases”. Dr. Sosnovsky’s interests spanned over a wide range of topic such as research and development of fungicides, herbicides, and insecticides, amidine derivatives as anti-radiation agents, and diazo dyes leading to a commercial copying process. Free radical chemistry in particular metal ion catalyzed redox reactions involving antioxidants and reactions with peroxides resulted in the discovery of the famous Kharasch-Sosnovsky reaction in 1958. Later, Dr. Sosnovsky focused on photochemical synthesis, oxidative phosphorylation reactions, synthesis of spin-labeled phosphorus compounds of biological interest including anticancer agents, organosulfur and organoselenium compounds. In 1980, his reach interest focused on medicinal chemistry, especially on structure-activity relationship of anticancer drugs involving design and biological evaluations. Related to his interest were pursuits in the synthesis of contrast-enhancing agents for diagnostic NMR-imaging (MRI) radiation sensitizers and synthesis of aminoxyl-labeled probes for studies of intracellular environments such as hypoxic cells by EPR and MRI. George was is Fellow of the Royal Society of Chemistry London England. 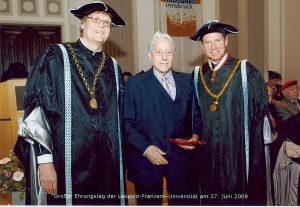 In 2009, Dr. Sosnovsky was made an honorary citizen of the University of Innsbruck for being one of their first graduate students after the Second World War. In order to support future generations of scientist, Prof. Sosnovsky created the Sosnovsky Endowment Fund provide funding for the “George and Christine Sosnovsky Awards in Cancer Therapy” overseen by the Royal Society of Chemistry (UK). More than nine leading scientist in the field of cancer therapy have already received this award. In addition, George provided funds for a similar but different award presented by the American Chemical Society. The first “George and Christine Sosnovsky Award for Cancer Research” was received by Laurence J. Marnett in 2012.